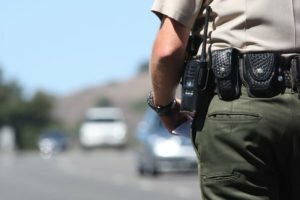 What Does a Speeding Ticket Do to Your Insurance? A speeding ticket may increase your auto insurance premium, but why does it do that? Every auto insurance policy is based on statistics that were created in order to best ascertain the risk of the insured. Auto insurance policies measure this risk and apply it to individuals, such as yourself, when you apply for insurance. The risk measures your chances of filing a claim due to an accident. The higher your risk of this claim-potential, the more of a liability you are to your insurance company, and the more your will be charged for coverage. The opposite is true of low-risk drivers. So what happens when you get a speeding ticket? Your auto insurance premium may not rise immediately if you get a speeding ticket. This is because auto insurance companies do not look at your driving history every month – they only do so when you renew your policy or are buying a new policy. If you have a history of good driving and a spotless driving record, your insurance company may look the other way. Don’t expect the same mercy from your insurance company if you have a history of bad driving and a novel’s worth of speeding tickets. The more speeding tickets you accrue, the more your insurance will rise. This increase may not be significant with each individual ticket, but over the long-run, the difference can be significant. Collect enough of them and your insurance company may deem you too risky to insure, in which case you will need specialty auto insurance to provide you with the coverage you may legally need. A quality auto insurance premium can’t help you keep your foot off the accelerator, but it can help cover you in case that lead foot of yours gets you into an accident. To get the coverage you need to be protected post-accident, contact Pierce Insurance Group in McKinney, Texas today. We can help you answer these questions!